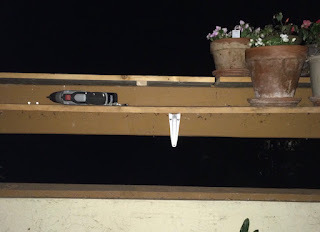 12 Midnite - I just finished installing spacers to lift up the balcony rail's protector board. Having the spacers allows fresh air under the protector board. This board used to be screwed down to the rail. I'm sitting on the balcony cot-bed, looking out at the small forest of trees to the north of Guava Gardens. It occurred to me, that when I am sitting on the cot, the only outside view that I have, other than sky, is between the balcony rail and the balcony wall. That was when it dawned on me. If I went ahead and built the Balcony Project, that I told you about a couple of days ago, the flower pots sitting on the new shelf would block my only outside view of the small forest! 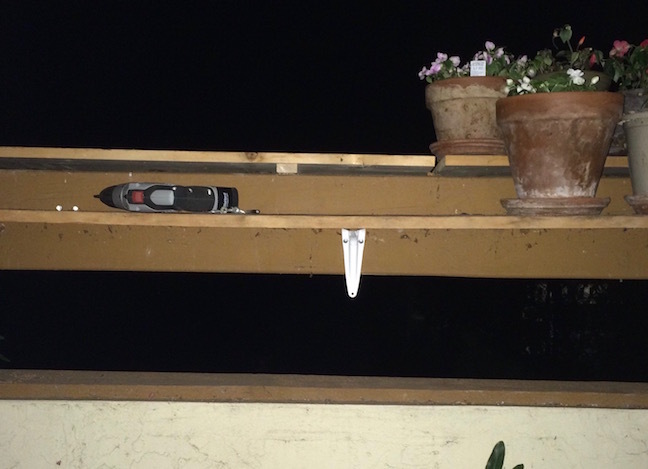 Gotta re-think this Balcony Project idea! If instead, a Cascading Shelf shelf took over the project, that shelf could provide a place for the tiny waterfall and all the camouflage plants surrounding the fall. At descending individual shelf heights! The tiny waterfall is the biggest thing on the balcony that caused water to go on the concrete floor. There are leak(s) in the fall. I did not pay much importance to the wet around the waterfall until landlord Robby got involved with water on his balconies. If I wanted to continue to use the tiny waterfall in my balcony flower garden, I would have to fix that leaking! When I went to Dixieline Hardware the other day, I asked for advice on how to fix the waterfall leak. 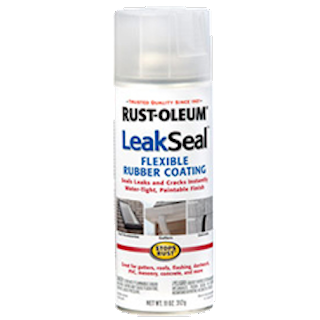 I was handed a can of Rust-Oleum LeakSeal. Wow! This stuff looked perfect. And it's from Rust-Oleum. 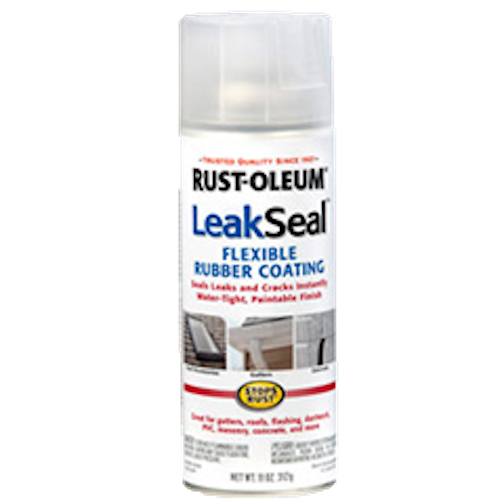 I've always had good luck with the Rust-Oleum brand. I've actually found some good things about my sickness. My sickness has slowed me way up. Being slow means that I think a lot more about stuff that I am doing than before I became sick. Example: I never really enjoyed my balcony flower garden before becoming sick. I didn't even spend much time in the garden. Now, I am out in the garden a great deal. I go slower now because I run out of energy and become tired. Being tired requires rest. I usually rest on the cot out on the balcony. My right hand and right arm control issues slow me down as well. Everything that I do that requires using my right hand and arm takes longer than before. Don't think of it as "sickness" George. Better I think is to call it aging. That's something we all do! Two of my doctors at Kaiser have been attempting to find a reason for my symptoms. So far, they have found nothing. But, if my doctors do find a reason, and then find a cure, will that cure be for the aging process? "DOCTORS AT KAISER PERMANENTE FIND CURE FOR AGING" "Population explosion expected".